AND HAS PROTECTION FROM ANY COPYRIGHT THAT MAY BE ATTRIBUTED TO DIOENI’S IMAGE BELOW DUE TO THE FACT THAT IT IS A SCAM AND FRAUD TO PROMOTE A WATCH THAT IS AN ABSOLUTE FAKE AS AN A-11 MILITARY ISSUE WWII. WRIST WATCH WOULD BE INVESTING IN A FAKE! IS THERE, OR WAS THERE EVER, A TRUE 24 HOUR HACKING BULOVA US MILSPEC MILITARY WATCH?? HELL NO! IMAGINE YOU ARE BEING RIPPED OFF AND GETTING RIPPED OFF AND RIPPED OFF ON AND OFF EBAY AND THE NAWCC AND OTHER ORGS ARE PARTICIPATING AND EVEN THE WATCH FORUMS ARE GETTING A PIECE OF YOUR ARZZ AND THEY ARE EITHER STUPID OR IGNORANT THOUGH IGNORANCE IS NEVER AN EXCUSE WHEN FACTS ARE AVAILABLE SO WHY THE BS???? READ AND EITHER WEEP OR SHOUT FOR JOY IF YOU KEPT YOUR BUCKS… I PLACED THE ABOVE BELOW DIRECT FACTUAL US MIL SPEC MILITARY LIST OF WATCHES AND DATES. THERE ARE MIL-SPC PAGES AND NONE HAVE A 24 HOUR MOVEMENT. OF ANY BRAND LET ALONE BULOVA. BEFORE READING BELOW VIEW THE ABOVE AND BELOW SHEET, THEN READ ON.WE HAVE ASKED ON OF THE INTERNETS MOST ACTIVE IN BULOVA 24 HOUR WATCHES TO SEND US SOME FACTS BUT HE HAS NOT. A NOTE, WHILE THERE IS NO MIL-SPEC FOR A TRUE 24 HOUR MIL WATCH, THERE ARE SOME PEOPLE WHO ARE REMOVING BULOVA CIVILIAN 1960 24 HR MOVEMENTS AND PLACING THEM IN BULOVA A-17-A HACKING CASES AND THEN OFFERING THEM FOR 5 TIMES THE PRICE OF A BULOVA MILITARY. VINTAGE 1961 STAINLESS BULOVA 3818A MILITARY HACK ORIGINAL MILITARY ISSUED STRAP AND ORIGINAL MILITARY VELCRO WITH COVER. CASE BACK SIGNED RESTORE BY ROCK -WRIST WATCH ID = MIL-W-3818A SER AF6645-808-1407 BULOVA STOCK NO. 10BNCH CONT. NO. DA-36-038-ORD-21169M U.S.+ MOVEMENT SIGNED 10BNCH BULOVA WATCH CO USA M1 (1961)CONDITION FINE TO MINTY PROOF. 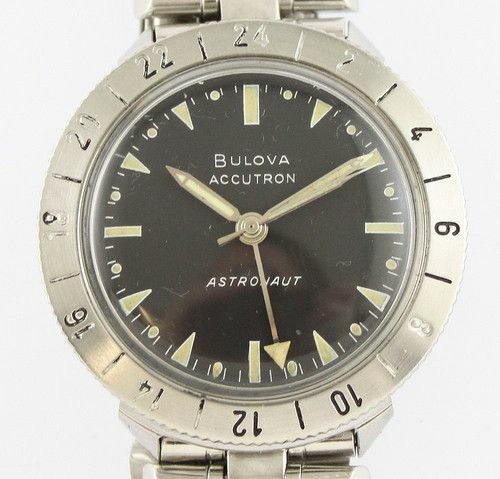 WHILE BULOVA CONTRACTED STAR WATCH CASE CO TO BUILD THEIR CASES, THERE WERE OTHERS -DEPENDING ON THE DATE ….THIS IS NOT A STAR CASE BUT IS A PURE BULOVA .HACKING A-17-A BUT NOT A TRUE 24 HOUR WATCH BECAUSE BULOVA NEVER MADE A PURE 24HR MIL-SPEC WATCH FOR ANY MILITARY .. EVER PERIOD AND NEVER EVER MADE USA MILITARY WATCHES AFTER 1958/ THUS THE USA MILITARY NEVER EVER HAD ONE! THIS IS A TRAINING PAGE CONCERNING TRUE OR UNTRUE: USA 24 HR MILITARY WATCHES? THAT MEANS ONE REVOLUTION EQUALS 24 HR RATHER THAN 12 HOURS. Visit TIMEFRAUD.COM FOR MORE INFO…. AN OFFER STATEMENT FROM EBAY. Crystal: Original domed acrylic is in good condition, nice and clear. Some very light scratches. Beware of non-Star watch cases that have mineral crystals, which are not original. Movement: Mechanical True 24 hour movement. 10BNCH hacks, winds, and sets. Keeping good time, within 7 seconds of quartz watch after 1 day on bench. Beware of other Bulova movements altered to be 24 hour movements. Unless some one can show me a contract or MILSPEC that WITH A CORRESPONDING NUMBERING SYSTENM ON THE CASE BACK.. WELL.. ONLY THEN WOULD THAT DEMONSTRATE THE GOV INVESTED IN TRUE 24HR BULOVA WATCHES.. BUT THEN YOU NEED TO SHOW THIS OCCURRED ! CAUSE BULOVA STIOPPED SELLING TO THE US DGOV! I MUST SAY THEY ARE FAKES. And, I am sure that no SPEC sheets exist due to the fact BULOVA LOST ALL DEALINGS WITH THE US MILITARY FROM 1956 THROUGH TO eternity…. AFTER THAT, THE US GOV HAD VIETNAM ON THEIR MINDS AND IN 1956 HAD DECIDED TO STOP THE REVOLUTION OF NIFTY NEW IDEAS, LIKE 24 HOUR HACKING WATCHES, AND STICK TO A 24 HR HACKING WATCH, WITH NO MAINTENANCE, SIMPLE 2 YEAR USE WITH , LIKE I SAID, NO SERVICE AT ALL. A THROW AWAY., THAT WAS 1956. SO THEY PREPARED THE SPEC SHEETS JUST FOR THAT. NOTHING FANCY LIKE 24 HR HACKING !!!!!!!!!! JUST KEEP IT SIMPLE. NO 24 HRS, NO NOTHING BUT HACKING. NO EXTRA JEWELS NO NOTHING BUT HACKING AND ABILITY TO SURVIVE EVERYTHING FOR 2 YEARS AND NO SERVICING. END OF LINE. FIRST CONTRACT FOR MARINE CORPS FOR A TOTAL OF 10,849 WATCHES @$28.28 EACH OR A TOTAL COST OF $306,809.72. THE US MILITARY KNEW THEY WERE GOING TO BE AT LEAST THIS MANY MARINES IN VIETNAM IN 1961/1962. THE PRELIMINARY SPECS WENT OUT DURING THIS TIME. IN THE COPY WORD FOR WORD, WE HAVE BULOVA ARGUING ABOUT THE AWARD OF THE CONTRACT. NOTE HOW THE BULOVA FAILED TESTING AND THE FACT OF A NEW CASE DESIGN, AND HOW BULOVA CONTINUED TO PUSH “CASE BACK: DESIGNS. A. REDUCE THE VARIETY OF GRADES AND TYPES OF WATCHES. B. ASSURE CONSISTENT QUALITY OF ITEMS. C. ELIMINATE TESTING REQUIREMENTS OF ONE YEAR AND SUBSTITUTE IN LIEU THEREOF A GUARANTEE PROVISION. D. INCORPORATE A NEW CASE DESIGN. ACCORDINGLY, THE SPECIFICATION WAS FORMALLY REVISED ON OCTOBER 17, 1962, AND IS IDENTIFIED AS MIL-W-3818B. SUBSEQUENT TO THE APPROVAL OF SPECIFICATION MIL-W-3818B, ALL SOURCES ON THE PREVIOUS QUALIFIED PRODUCTS LIST, UNDER SPECIFICATION MIL-W 3818A, WERE INVITED BY LETTER DATED DECEMBER 6, 1962, TO MAKE APPLICATION FOR THE SUBMISSION OF THEIR PRODUCT OF FRANKFORD ARSENAL FOR QUALIFICATION TESTING. UPON RECEIPT AND APPROVAL OF THE APPLICATION AS REQUIRED BY PARAGRAPH 104 OF THE PAMPHLET ENTITLED “PROVISIONS GOVERNING QUALIFICATION,” SAMPLES WOULD BE AUTHORIZED TO BE SUBMITTED. THREE FIRMS SUBMITTED APPLICATIONS AND SAMPLES DURING 1963, NAMELY, BENRUS WATCH CO., INC., LONGINES-WITTNAUER WATCH CO., AND MATBEY-TISSOT WATCH CO., INC. HOWEVER, BENRUS WATCH CO., INC., WAS THE ONLY SOURCE THAT SUCCESSFULLY MET THE REQUIREMENTS FOR APPROVAL. THEREFORE, THAT FIRM WAS FORMALLY NOTIFIED ON SEPTEMBER 16, 1963, THAT THE SAMPLES SUBMITTED WERE APPROVED AND THAT ITS PRODUCT WAS LISTED ON THE QUALIFIED PRODUCTS LIST FOR SPECIFICATION MIL-F-3818B. THE OTHER TWO SOURCES WERE NOTIFIED BY LETTER OF NOVEMBER 21, 1963, THAT THEIR SAMPLES DID NOT MEET MINIMUM SPECIFICATION REQUIREMENTS. “A. THIS WATCH IS A QUALIFIED PRODUCT AND THE TIME REQUIRED FOR TESTING WOULD UNDULY DELAY DELIVERIES. “B. THE INTEREST OF THE GOVERNMENT REQUIRES ASSURANCE PRIOR TO AWARD THAT THE PRODUCT IS SATISFACTORY FOR ITS INTENDED USE AND NO OTHER MEANS OF QUALITY ASSURANCE IS AVAILABLE. THE REQUEST FOR PROPOSAL WAS ISSUED ON FEBRUARY 7, 1964, WITH A CLOSING DATE OF FEBRUARY 24, 1964, TO BENRUS WATCH COMPANY, AS A SOLE SOURCE PREMISED ON THE FACTS SHOWN ABOVE. BENRUS QUOTED A UNIT PRICE OF $28.28 EACH FOR A QUANTITY OF 10,849 WRIST WATCHES OR A TOTAL COST OF $306,809.72. ON FEBRUARY 20, 1964, AN AMENDMENT WAS ISSUED EXTENDING THE CLOSING DATE TO FEBRUARY 27, 1964. THE PROCUREMENT ACTION WAS SYNOPSIZED, FOR SUBCONTRACTING ONLY, IN THE COMMERCE BUSINESS DAILY DATED FEBRUARY 17, 1964. AT YOUR REQUEST, YOU WERE FURNISHED A COPY OF THE REQUEST FOR PROPOSAL ON FEBRUARY 13, 1964. YOU ALLEGE, IN EFFECT, THAT FRANKFORD ARSENAL IS ATTEMPTING TO CIRCUMVENT CURRENT REGULATIONS IN THE AREA OF COMPETITION AND METHOD OF PROCUREMENT AND HAS FAILED TO CLARIFY AMBIGUITIES IN THE SPECIFICATION, PARTICULARLY WITH REFERENCE TO THE GUARANTEE PROVISION AS SET FORTH IN PARAGRAPH 3.21 OF SPECIFICATION MIL-W-3818B, DATED OCTOBER 17, 1962. YOU ALLEGE SPECIFICALLY THAT FRANKFORD ARSENAL, WITH KNOWLEDGE OF YOUR INTEREST IN THE PROCUREMENT OF BACK-TYPE WATCHES, CIRCUMVENTED PROCUREMENT REGULATIONS BY NOT OBTAINING COMPETITION. THE RECORD SHOWS YOU WERE AFFORDED AMPLE TIME TO SUBMIT YOUR PRODUCT FOR QUALIFICATION TESTING AND POSSIBLE INCLUSION ON THE QUALIFIED PRODUCTS LIST. HOWEVER, YOU DID NOT SUBMIT YOUR PRODUCT UNTIL FEBRUARY 13, 1964, A LAPSE OF 14 MONTHS FROM THE DATE APPLICATIONS WERE ORIGINALLY REQUESTED. THE PRODUCT YOU SUBMITTED WAS REJECTED ON MARCH 11, 1964, FOR THE REASON THAT IT FAILED THE SHOCK TEST PERFORMANCE PRESCRIBED IN PARAGRAPH 4.8.9 OF SPECIFICATION MIL-W 3818B IN THAT OVER A PERIOD OF 20 HOURS THE WATCH GAINED 1 HOUR AND 22 MINUTES. THIS FAILURE WAS CONSIDERED A SUFFICIENT CAUSE TO REJECT YOUR PRODUCT AS NOT QUALIFYING FOR INCLUSION ON THE QUALIFIED PRODUCTS LIST. SINCE ONLY ONE OF THREE OTHER SOURCES WHICH SUBMITTED THEIR PRODUCT FOR QUALIFICATION TESTING SUBMITTED A PRODUCT WHICH PASSED ALL THE REQUIREMENTS OF MIL-W-3818B AND WAS APPROVED FOR INCLUSION ON THE QUALIFIED PRODUCTS LIST, THE DETERMINATION BY THE CONTRACTING OFFICER THAT IT WAS IMPRACTICABLE TO OBTAIN COMPETITION, AND THAT A CONTRACT SHOULD BE NEGOTIATED WITH BENRUS, APPEARS TO HAVE BEEN PROPER. YOU FURTHER ALLEGE THAT THE PROPOSED PROCUREMENT SHOULD BE CANCELLED AND THAT THE GOVERNMENT SHOULD PROCEED ON AN ADVERTISED PROCUREMENT TO ASSURE ADEQUATE COMPETITION. AS INDICATED ABOVE, COMPETITION COULD NOT BE ATTAINED BECAUSE ONLY ONE SOURCE WAS ON THE QUALIFIED PRODUCTS LIST AT THE TIME OF THE INITIATION OF THE PROCUREMENT ACTION, AND SO FAR AS WE ARE ADVISED NO OTHER PRODUCT HAS SINCE BEEN QUALIFIED. IN OUR DECISION OF AUGUST 9, 1961, 41 COMP. GEN. 93, IT WAS HELD THAT WHERE THERE IS ONLY A SINGLE SOURCE LISTED ON THE QUALIFIED PRODUCTS LIST, THE PROPER METHOD OF PROCUREMENT IS NEGOTIATION IN LIEU OF FORMAL ADVERTISING. WE SEE NO VALID BASIS UPON WHICH A DIFFERENT CONCLUSION MAY BE REACHED IN THE INSTANT CASE. IN ADDITION, YOU ALLEGE THAT THE GUARANTEE PROVISION OF PARAGRAPH 3.21 OF MIL-W-38188 IS UNREASONABLE IN THAT IT REQUIRES THE CONTRACTOR TO BE LIABLE FOR THE REPAIR OF WATCHES THAT FAIL TO MEET ALL SPECIFICATIONS FOR A PERIOD OF TWO YEARS, AFTER ACCEPTANCE BY THE GOVERNMENT, WITHOUT ANY LIMITATION OF REPAIR RESPONSIBILITY WHATSOEVER. SINCE THE THREE SOURCES THAT SUBMITTED THEIR PRODUCTS FOR TESTING DID NOT TAKE ANY EXCEPTION, OR REQUIRE INTERPRETATION AS TO THE GUARANTEE PROVISION IN THE SPECIFICATION, IT APPEARS THAT THOSE FIRMS WERE READY TO MEET SUCH PROVISION AND THAT THE PROVISION WAS CONSIDERED REASONABLE. ANY EVENT IT DOES NOT APPEAR THAT THE GUARANTEE PROVISION IS GERMANE TO YOUR PROTEST OR TO YOUR FAILURE TO HAVE A WATCH APPROVED FOR INCLUSION ON THE LIST. AS TO THE ALLEGATION THAT BENRUS WATCH COMPANY IS NOT A MANUFACTURER OF WATCHES BUT ONLY IMPORTS CASES AND SELLS WATCH MOVEMENTS FROM FOREIGN SOURCES, WE ARE ADVISED THAT BENRUS POSSESSES MANUFACTURING FACILITIES IN THE UNITED STATES AND SWITZERLAND WHICH ARE UTILIZED IN THE PRODUCTION AND ASSEMBLY OF WATCHES AND, THEREFORE, QUALIFIES AS A MANUFACTURER UNDER ASPR 12-603.1. THE BENRUS PROPOSAL SHOWS THAT IT IMPORTS THE MOVEMENT AND DIAL SETTING, DIAL STEM AND SPRING BARS, AND THAT THE CASE, CROWN, ATTACHMENTS, PACKING MATERIAL AND JEWEL BEARINGS (TURTLE MOUNTAIN ORDNANCE PLANT) ARE ALL DOMESTICALLY PRODUCED. ITS COST DATA INDICATES THAT THE COST OF THE DOMESTIC COMPONENTS IS CONSIDERABLY IN EXCESS OF 50 PERCENT OF THE COST OF ALL COMPONENTS, AND THEREFORE THE ITEM MUST BE CONSIDERED A DOMESTIC SOURCE AND PRODUCT UNDER ASPR 6-101 (D). So, to say that Bulova created a Hacking 24hr Military watch any time between 1955 and 1965 is pure BS! THERE WERE NO SPEC SHEETS. NO CONTRACTS. NO INFO ON THE REAR CASES OF ANY OF THESE WATCHES OFFERING ANY FACTS TO STATE THAT THEY ARE HACKING 24 HR WATCHES… NOTE??? THAT???? FACT???? EVERY MILITARY WATCH THE US PROVIDES IT’S TROOPS HAS A CONTRACT, A SPECIFICATION “BOOK” .. WELL, IT IS AT LEAST A DOZEN TYPED PAGES LISTING EVERYTHING IMAGINABLE… THERE US NONE…. AND NO, IT DID NOT GET LOST… WE HAVE THEM ALL. I RECENTLY NOTED A SERIES OF alleged SUPER RARE 24 HOUR MILITARY WATCHES BEING OFFERED. IT IS THE BULOVA A-17/3818A TYPES THAT CONCERN ME THE MOST, ESPECIALLY WITH 900.00 PRICE TAGS. OFFERS LIKE THE ONE BELOW ARE RAMPANT IN THEIR DEMAND FOR 1000.00 A POP. Movement Military Wristwatch. It is fully operational and the hack function is working. This watch is in very good condition with just a couple minor blemishes. This watch is a very rare find because of its 24 hour (hour hand completes 1 cycle/revolution per day) hacking movement and dial. Case: Excellent condition. All stainless steel, original, very crisp, 33mm wide, screw down back, military Ordinance information on case back. Some light scratches. Beware of other sellers with cases that have no ordinance information and no Star Watch Case embossed logo on the case back, they are fake. Movement: Mechanical True 24 hour movement. 10BNCH hacks, winds, and sets. ***Beware of other movements altered to be 24 hour movements, the only original 24 hour movements are the 10BNCH and the 10CNCH, which both have the hack mechanism. THE ABOVE OFFER IS A FRAUD……. PROBLEM WAS/IS NO INFO WAS PROVIDED!!!!!!!!!!!!!!!! WHICH ARE ONLY FOR HACKING WATCHES: PULL STEM THE MOVEMENT STOPS. ABOVE IS A PARTS MOVEMENT WITH THE HOUR WHEEL + MINUTE WHEEL. SO, IS THERE A True 24 Hr BULOVA MILITARY? THERE WAS A 24HR WATCH BUILT BY BULOVA FOR PUBLIC CONSUMPTION. BUT NEVER FOR THE MILITARY AND NEVER HACKING! THERE ARE NO PRE-CONTRACT OR POST SPEC SHEETS W/ANY DETAILS FOR A 24 HR WATCH AND NO SPEC NUMBERS! NO INFO NO MILITARY CONTRACT NO SPEC SHEET CALLING FOR A BULOVA 24 HR MILITARY WATCH. NOTE THAT IT IS STATED THE 10CNCH MOVEMENT IS STATED TO DATE TO 1960-61 ERA 24 HOUR BULOVA WATCHES FOR THE GENERAL PUBLIC??? NO FACT SHEETS, SPECIFICATIONS OR ITEM NUMBER FOR A BULOVA 24 HR MILITARY. BULOVA LOST OUT ON THE MILITARY CONTRACTS STARTING IN 1956 THROUGH OUT 1966. SO WHEN WAS THIS ALLEGED HACKING 24 HR MILITARY WATCH MADE??? THEIR LAST CONTRACT WAS ONE FOR DIVE WATCHES AND THEY GAVE THAT ONE UP ALSI TO TORNEK WHO BUILT THE SEALS WATCH???? FIRST CONTRACT FOR MARINE CORPS FOR A TOTAL OF 10,849 WATCHES @$28.28 EACH OR A TOTAL COST OF $306,809.72. THE US MILITARY KNEW THEY WERE GOING TO BE AT LEAST THIS MANY MARINES IN VIETNAM IN 1961/1962. THE PRELIMINARY SPECS BEGAN IN 1956 AND WENT OUT 1958/59. IN THE COPY WORD FOR WORD, WE HAVE BULOVA ARGUING ABOUT THE AWARD OF THE CONTRACT. NOTE HOW THE BULOVA FAILED TESTING AND THE FACT OF A NEW CASE DESIGN, AND HOW BULOVA CONTINUED TO PUSH “CASE BACK: DESIGNS. FURTHER REFERENCE IS MADE TO YOUR LETTER OF FEBRUARY 20, 1964, PROTESTING THE AWARD OF A CONTRACT TO BENRUS WATCH COMPANY UNDER REQUEST FOR PROPOSAL NO. AMC/A/36-038-64-490/NS), DATED FEBRUARY 7, 1964. SUBSTITUTE IN LIEU THEREOF A GUARANTEE PROVISION. ACCORDINGLY, THE SPECIFICATION WAS FORMALLY REVISED ON OCTOBER 17, 1962, AND IS IDENTIFIED AS MIL-W-3818B. SUBSEQUENT TO THE APPROVAL OF SPECIFICATION MIL-W-3818B, ALL SOURCES ON THE PREVIOUS QUALIFIED PRODUCTS LIST, UNDER SPECIFICATION MIL-W 3818A, WERE INVITED BY LETTER DATED DECEMBER 6, 1962, TO MAKE APPLICATION FOR THE SUBMISSION OF THEIR PRODUCT OF FRANKFORD ARSENAL FOR QUALIFICATION TESTING. UPON RECEIPT AND APPROVAL OF THE APPLICATION AS REQUIRED BY PARAGRAPH 104 OF THE PAMPHLET ENTITLED “PROVISIONS GOVERNING QUALIFICATION,” SAMPLES WOULD BE AUTHORIZED TO BE SUBMITTED. THREE FIRMS SUBMITTED APPLICATIONS AND SAMPLES DURING 1963, NAMELY, BENRUS WATCH CO., INC., LONGINES-WITTNAUER WATCH CO., AND MATBEY-TISSOT WATCH CO., INC. The modern scuba diving watch was introduced to the public in 1954 at the annual watch trade show in Basel, Switzerland; BLANCPAIN AND ROLEX INTRODUCED THE FIFTY FATHOMS AND RO9LEX SUBMARINER RESPECTYIVELY..
With existing contracts with the Air Forces and Army, the US Navy FIRST entered into an agreement with the Bulova Watch Company IN 1956, and it’s Bulova Research and Development Laboratories, to develop and manufacture a new AUTOMATIC DIVE WATCH WITH PLEXIGLASS CRYSTAL AND 350 FEET CAPABILITY. BY 1964 THE BULOVA 666 (FEET) & 333 (FEET) MODELS WERE LAUNCHED ALL FUTURE LINES AND MODELS OF THE FAMOUS NAVY MILITARY DIVE WATCHES DURING VIETNAM WAR AND ALL FUTURE DIVE WATCHES. WE CAN NOTE WITH PLASTIC/PLEXIGLASS CRYSTALS, INCLUDING THE DOXA. ADDITIONALLY, THE FIRST OFFICIAL US MILITARY DIVER WATCH WAS IS THE RESULT OF THREE GOVERNMENT CONTRACTS FROM 1958,TO 1961, [MIL-W-3181 / MIL-W-22176 / MIL-W-22176A]. IT WAS IN 1961 THAT BULOVA, UNDER US NAVY CONTRACT TO PERFECT THE FIRST AUTOMATIC DIVE WATCH WITH PLEXIGLAS CRYSTAL, WAS FINALLY SUCCESSFUL AND IT PASSED ALL GOVERNMENT TESTS INCLUDING DIVING TO 392 FEET. WHILE STILL IN DEVELOPMENT, BULOVA DROPPED THEIR CONTRACT & THE CONTRACT WAS TAKEN OVER BY BLANCPAIN, [“BLANCPAIN MI SPEC 1” ]WHO PRODUCED THE TR-900 DIVE WATCH. THE TR-900 DIVE MATCHED MUCH OF THE SPECS, CASING AND OTHER DESIGNS OF BULOVA’ FINAL VERSION, INCLUDING THE VERY LOOK AND DESIGN DOWN TO THE RADIUM MARKERS, MOISTURE INDICATOR, BEZEL AND BEZEL INSERT. ABOUT 1000 TR-900?S WOULD BE PRODUCED UNDER TWO CONTRACTS FOR THE NAVY DURING 1964 & 1965 AND ISSUED TO NAVY UDT FROGMAN TEAMS AND MARINE RECON UNITS DURING THE VIETNAM WAR. AROUND THE SAME TIME, BULOVA RELEASED THEIR PLEXIGLAS AUTOMATIC 666 DIVE WATCH FOR COMMERCIAL SALES AND WERE AVAILABLE AT MILITARY PX ANSD R&R LOCATIONS. IT IS IN THIS TIME FRAME THAT ELGIN PRODUCED THEIR FIRST AUTOMATIC WATER PROOF, ALL STEEL DIVE WATCH WITH RADIUM MARKERS. BY 1964-1967, DIVE WATCHES WERE IN HIGH DEMAND. ESPECIALLY AUTOMATICS. AND, WITH A WET HOT HUMID VIETNAM WAR BUILD UP— THE PX & R&R LOCATIONS WERE A HOT MARKET. BULOVA, WHO ACTUALLY DEVELOPED THE FIRST AUTOMATIC DIVE WATCH WITH PLASTIC CRYSTAL UNDER US CONTRACT, RELEASED THEIR AUTOMATIC MODEL IN COMPETITION WITH THE 1964 ZODIAC SEA WOLF AUTOMATIC. WHICH WAS INTRODUCED AT THE 1964 WORLDS FAIR. THE ABOVE ADVERT INFORMS IT’S READERS TO VISIT THE ZODIAC EXHIBITION IN THE SWISS WATCH PAVILION AT THE NEW YORK WORLDS FAIR AND THE ADVERTISING CAMPAIGN WAS HEAVY ON TV AND RADIO. THIS WAS 1964, IN FLUSHING QUEENS NY. I WAS THERE AND VISITED THE PAVILION. IT WAS FREE. IF YOU READ MY BOOK, YOU WOULD READ HOW WE WENT TO 14 FREE EXHIBITS THE WATCH PAVILION, GENERAL ELECTRIC AND THE IBM EXHIBITS WERE THE BEST AND THE AMPHIBIAN CAR THAT WENT INTO WATER MADE IT A GREAT EXPERIENCE; ESPECIALLY FOR MY BROTHER WHO WAS 7 AND I , AT 11, WERE JUST KIDS BEGINNING A JOURNEY [“RUNNING AWAY”]. BOTH OF THESE, AS WELL AS OTHERS, WERE INVESTED IN BY US AND AUSTRALIAN SOLDIERS FROM PRIVATE TO OFFICER…I FACT, BULOVA MADE MORE SALES AND MONEY THAN BLANCPAIN, WHO HAD TAKEN OVER THE BULOVA CONTRACT AND UTILIZED ALL THE MAIN FEATURES OF BULOVA RESEARCH IN PRODUCING THE US MILITARY DIVE WATCH! WALTHAM [ABOVE], ANOTHER LONG TIME US MILITARY WATCH DEVELOPER, FOLLOWED WITH THEIR OWN MODEL WHICH WAS LARGER THAN THE BULOVA, ZODIAC OR ELGIN. ELGIN, WHO HAD SUPPLIED US MILITARY WATCHES SINCE WWI. RELEASED THERE OWN VERSION WITH STRAIGHT DROP LUGS, MEDIUM BEZEL IN A SMALL CASE SIMILAR TO THE OLD ELGIN WWII CASES. IT WAS ONLY LARGER DUE TO THE BEZEL. AND, FINALLY, WE HAD BENRUS. BENRUS HAD, BY BEATING OUT BULOVA, ACTUALLY WON THE FIRST MAIN CONTRACT FOR MILITARY ISSUED VIETNAM SERVICE US ARMY AND AIR FORCE WATCHES AND ALSO A MILITARY DIVE WATCH. THEY WOULD INTRODUCE THE SINGLE CASE BENRUS. 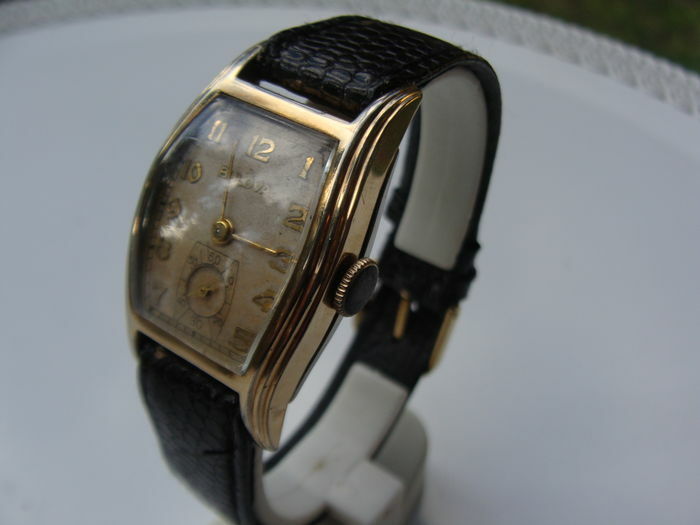 AT THAT TIME, DUE TO ITS SINGLE CASE DESIGN AND THE SIMPLY BEZEL WITH ELGIN STYLE LUGS, IT BECAME A HIT WITH THE GI’S. BUT THEY TOOK ANOTHER STEP. TO MAKE THEIR DIVE WATCH STAND OUT, THEY INTRODUCED A LIMITED 25 JEWEL INCABLOC MODEL. THEY UTILIZED A 25J A.S. EUBACHE AND A ETA 17J ROTOR ASSEMBLY TO PRODUCE THE LIMITED SELF WINDING ULTRA DEEP 666 FEET.